Nature school started up in 1988 and welcomes children between 6-16 years of age. School classes visit the School once a year. Here, courses based on various themes are offered. 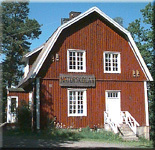 Before each visit at Naturskolan, the pupils are prepared by their teacher, and subsequently, further work is done back in the home classroom. 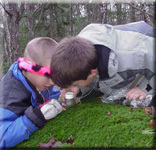 Each grade has it’s specific theme such as the senses, mosses and lichens, water life, ancient techniques, hillside insects, winter ecology, pine forest and deciduous forest ecology. Through getting used to being outdoors at an early stage, the foundation for an appreciation for the environment is laid. enjoyment of the countryside is the foundation for explaining the ecological connections and a condition to be able to understand environmental issues. This applies to children as well as adults. Developing one’s feeling for nature is an important first step. Knowledge about nature starts in nature. It’s important to find the path, a path filled with experiences and discoveries. Read more about the Nature school. Experiences by using all senses strengthens the feeling for nature. The pupils own experiences create a central foundation for learning. Daring to examine by yourself, with all your senses also gives a sense of security and makes you feel akin to the environment. The next step on the path towards the understanding of nature is to discover multitude. And to ask questions. Examining the multitude of small animals and insects in the lake result in many exciting discoveries. Here, questions are also raised, such as: how come animals can live in water? What do they live off? How do they breathe?